If you're sensing a bit of a monochromatic theme with this month's favorites you're not wrong. And the monochromatic...ness is actually quite fitting for this roundup which is chock full of simple, minimalist products that accomplish exactly what they set out to do. Let's start with the skincare which makes up the bulk of my favorites. Verso Night Cream* for a few weeks now but have already seen some incredible results. 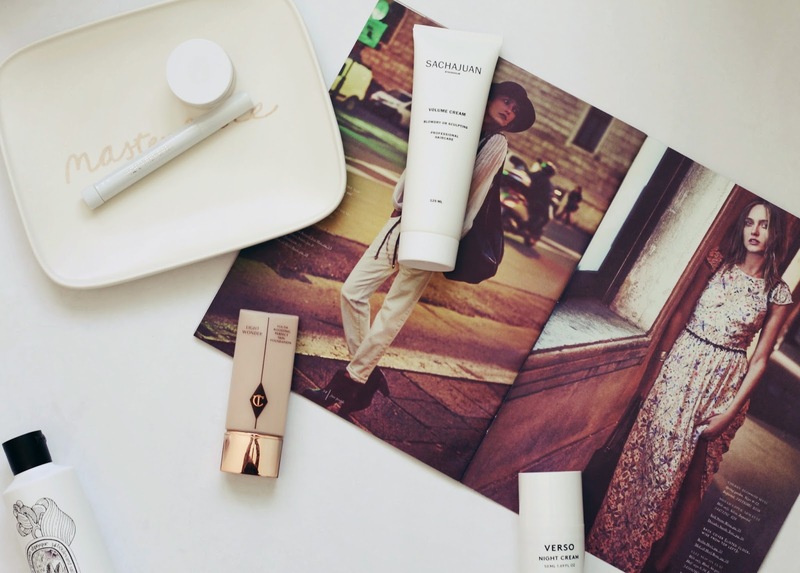 Like all Verso products, the Night Cream contains the incredibly powerful and effective Retinol-8, an ingredient that helps activate the skin to stimulate its natural production of collagen. In my case, it has helped heal acne scars and smooth out the texture of my skin considerably, leaving me with much clearer, healthier looking skin. The Night Cream is also filled with hydrating properties that make it perfect for nighttime wear, leaving my face nice and smooth in the morning. Another nighttime product I've been loving has been the Omorovicza Gold Eye Lift*. I mentioned this guy in my recent post on eye creams where I went into more detail about the product, but I'm still absolutely adoring using it. It always leaves my under eyes super hydrated, smoothed out and brighter looking. It also takes the tiniest amount of this product to cover both eyes - I know that phrase is way overused in the beauty blogging community, but with this very rich cream I am absolutely serious. Another skincare love this month has been the AquaReveal Smooth Talker Water Peel for Lips, which might just win the award for having the longest title of any product ever. I had never heard of this brand before, but on a recent Space NK trip I was introduced to it when I mentioned that I needed a good exfoliant for my lips. I plan on writing about the line in more detail soon, but basically this vegan, mostly organic liquid works to immediately take off any dead skin without the use of any harsh acids or chemicals. Instead it uses new technology to completely eliminate any dead skin without harming the new skin underneath. The line also makes products for the face and body (all three of which I will feature in an upcoming post) and they are, in a word, amazing. My lips have never been smoother, and I truly have this product to thank for that. For the body, I have been loving my using my new Diptyque Eau Rose Body Lotion. I should say upfront that it's not the most hydrating lotion by any stretch of the imagination, but the smell is to die for. It immediately puts me in a better mood when I apply it, and the scent just gets me so ready for spring! Finally, I have one makeup and one haircare product to add to this very skincare-heavy mix. Both products are ones I've mentioned numerous times on the blog before, and my love for each is still going strong. The Charlotte Tilbury Light Wonder Foundation (in shade 2 Fair) is the perfect lightweight base for winter, giving your skin a healthy, lit-from-within glow while still covering any redness. I love how natural it looks and how I can barely feel it on my skin - it's great all year round and I already own it in shades that fit both my summer and winter skin coloring. As for the haircare, I am absolutely obsessed with the incredible Sachajuan Volume Cream*, especially after getting my hair cut a little shorter. Not only does the product smell heavenly but it also works to give some volume and texture to my hair without every weighing it down (not an easy feat). It's been my go-to hair product recently and I don't see that changing anytime soon.